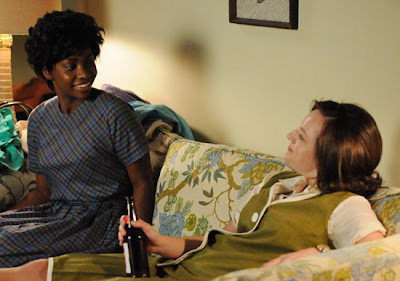 Teyonah Parris (l) and Elisabeth Moss (r) in "Mad Men"
This is a subject we've talked about a few times on Cinema in Noir, and I hear it's been on many others' minds. It's about adding characters of color to films and on various TV shows. In an often colorless movie or TV series, there's always a question of how the characters of color fit into the equation, and where's their side of the story? This brings me to the popular TV drama, "Mad Men." If you're a fan like me, you were glued to the tube on Sunday for its sixth season premiere on AMC. In case you're not familiar, the show follows an ad agency in 1960s New York City, and the trials and the complex personal lives of those who work there. The series has been pretty good about detailing the overall gender politics both in the office and at home, but--even though the show is set during this particularly turbulent decade, politically--it has yet to explore more deeply the racial politics outside of the views of the somewhat disconnected main characters on the show. Just imagine how much the show would benefit from the perspective of a character of color. 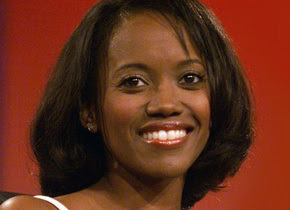 That's where Erika Alexander's interesting new blog entry comes in. A friend sent me a post written by the actress, best known for her TV roles on "Living Single" and "The Cosby Show." In addition to her varied TV work, including upcoming projects through 2014, she has apparently been writing and pitching TV shows left and right in Hollywood for years. And as a self-proclaimed fan of "Mad Men," she recently penned a re-imagined arc for the show, with the addition of principle African-American characters and plotlines. So I thought this would be something cool to share with you, as an example of how to eliminate tokenism and provide a universally themed arc that utilizes the actors to their full potential and fleshes out their characters' development. It can be done, and done well. You can find Alexander's full blog post here. And here's her spec titled, "Mad Men Uptown Saturday Night." It's actually pretty good. I'd watch it. Read it yourself and share your thoughts below. OMG..I absolutely LOVED it. I have watched this show since day "1"..and you were spot on...Great you actually had the essence of each of the characters. It is true that Mad Men has remained at the top of popularity graph for a long time, and it has also influenced the dressing style of people to a great extent. If you still want to watch the missing episodes of Mad Men, you can visit alluc.to and find the best platform to watch it online.